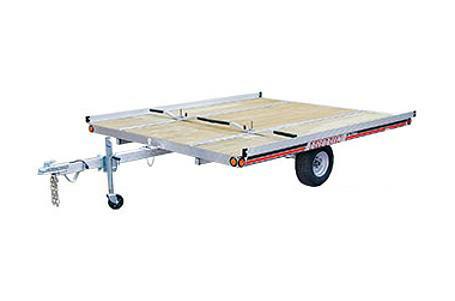 Our Elite line of lightweight aluminum trailers is designed with the utmost precision for years of trouble-free service. With features like a 5/8” thick plywood deck and full-length quickslides, you can be sure every detail has been crafted to meet the unique needs of snowmobile hauling. 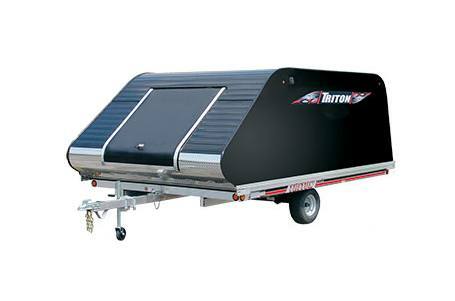 Triton offers the same high standard in snowmobile covers, a great addition to an Elite trailer. Be sure to request a quote from your dealer when you find the model you’re looking for. Shown with options. Some tire upgrades require spacer kits. See your dealer. Brake options are surge disc brakes and electric drum brakes. Brake options will change the overall length of the trailer. Recommended tongue weight 7-10% of GVWR. It is the responsibility of the purchaser to adhere to the brake laws regarding trailers. For full information on the laws in your state, contact the appropriate state motor vehicle department.